“I should get a Raspberry Pi,” I said one night as we were watching TV. “Well, if that’s what you really want, put it on the list and I’ll get one when I go to Wegmans,” Denise replied, thinking my comment to be a bit random. I wasn’t talking about about desert, of course, but rather the tiny, TV-ready computer produced by the Raspberry PI Foundation. I’d been thinking about setting up a TV connected computer for a while, looking at several Micro-ITX form factor machines, but I couldn’t quite justify spending a few hundred dollars on what would basically become a video player. 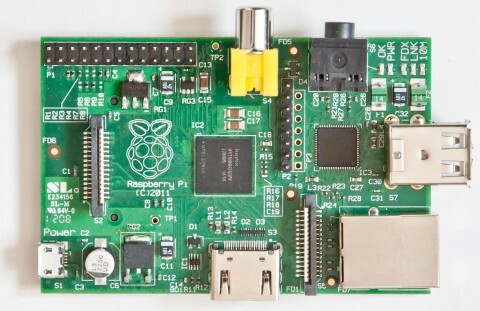 Raspberry Pi Model B, complete with ARM11 processor, 512Mb of RAM, and HDMI output capabilities. TV watching is usually a background process for me—I’m usually doing something else while I watch, and that something else often includes my laptop. With more and more content available online these days, I find myself frequently streaming video, but it is sometimes frustrating because it prevents me from doing other things on the computer while my TV sits idle. The Raspberry Pi seemed like the perfect solution…at $35 the Pi costs less than a streaming device like Roku or Apple TV, but also has the ability to do run lots of other software in addition to streaming. And since it runs off a 750 mA phone charger, the always-on Pi consumes hardly any energy. A few weeks ago, Denise’s laptop’s hard drive started acting up, so I went online to find a replacement. Since I needed to place an order anyway, I though “why not get a Pi while I’m at it.” I got my Pi from an Amazon partner, not an official distributer, and I paid a bit more than the standard $35, but since it was shipped by Amazon I avoided shipping charges and it all evened out in the end. In addition to the Pi I also ordered a Kootek case to keep the Pi’s circuit board protected and a Rosewill 5-port Ethernet switch. I was already using a HomePlug powerline Ethernet setup to connect my BlueRay player to my router, so I figured the switch, which cost about same as a decent WiFi adapter, the would let me connect both devices easily. I had planned to use an existing Bluetooth keyboard with my Pi, paired to a $5.00 USB dongle I picked up somewhere a while back, but I quickly learned that Bluetooth can be a nightmare to configure on Linux, so after about a week of fighting, I picked up a Logitech K400r wireless keyboard a trackpad combo that works great. In all, I probably paid about $75-$80 to get the Pi up and running—not pocket change, but not an unreasonable investment, either. It took a few false starts to get up and running, but I’ve now got the Pi working quite well. I decided to use the Raspberry Pi-optimized Debian Linux distro, Raspbian, for my OS because it offered the most flexibility. Using Michael Gorven’s packages and instructions, I was able to get XBMC, a great media player designed for the ten-foot user interface, loaded and running, which was the primary goal of my project. In addition to XBMC, I’ve managed to set up an OpenVPN server, giving me a private, remote gateway into my home network. I’m now starting to play with emulators and hope to have the Pi emulating my old Apple IIGS and Intellivision game console soon. I’ll be posting some tutorials and solutions to some of my stumbling blocks on here in the next few weeks. Overall the Pi runs well. It can be a little sluggish when loading web content, but once the GPU kicks in, video performance is great. I’ve watched a number of videos from YouTube, TED Talks, and a handful of TV networks through XBMC and I don’t think its ever stopped to buffer (I wish I could say the same for my BlueRay player!). I’m starting to dream up ideas for my next Pi (or Pis? )—I’m thinking about setting up a dedicated file and print server so that I can shut down my old desktop PC when I’m not using it. The Pi, from what I hear, can also be a great Wake-On-LAN server, so I could remotely boot the desktop from afar if I ever found that I did need something on it, too. I’m also thinking up home automation ideas for the Pi as well as some possible ideas for a “carputer” in my truck. Looking at some of the projects featured on sites like the Raspberry Pi blog, LifeHacker, and Hackaday.com, it’s clear that the sky’s the limit for this cheap, little computer.